Competing in the series at least on dates not conflicting with planned runs in the NASCAR Nationwide Series, JR Fitzpatrick got back behind the wheel of the family-owned #84 Chevrolet for the first pole run of the 2011 season. In the #22 Canadian Tire Dodge, Scott Steckly started alongside Fitzpatrick as the field took green at Mosport Speedway. While JR Fitzpatrick was able to led the race's first 10 laps, a new NASCAR Canadian Tire Series competitor flew around the #84 Chevrolet for an early lead. The #15 Ford driven by freshman Steven Matthews would sprint out front of the Dickies 200 on lap 11 and hold the position for 36 laps. A rookie of the year contender for the 2011 NASCAR Canadian Tire Series tour, 20-year old from New Liskeard, Ontario would be strong earlier but show some inexperience as the race progressed. Making contact with fellow rookie Isabelle Tremblay on lap 45, Steven Matthews would spin his #15 car in turn 1 on lap 119 drawing the race's 2nd caution. Matthews rallied his damaged Ford back to a 10th place finish as the top rookie of the Dickies 200. Following Steven Matthews' time at the front, reigning 2010 champion DJ Kennington surged to the lead on lap 47 in his #17 Castro-sponsored Dodge Challenger. 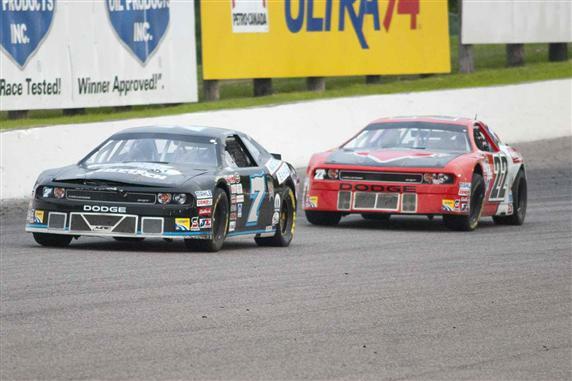 The #22 Dodge Challenger of Scott Steckly followed Kennington by the #15 car of Matthews as the two Chrysler products fought for the Dickies 200 lead at Mosport Speedway. Spending 11 laps out front, Kennington was overhauled by Steckly. With only one caution in the first half of the Dickies 200 for fluid on the race track, the yellow flag slowed the field four times at Mosport in the second-half race stage. Many of the front running cars including Kennington and the #02 Ford of Kerry Micks were involved in the late race calamity. In the final circuits of the 200-lap event, Scott Steckly held off a last year's Kawartha Speedway winner Pete Shepherd for victory at the Dickies 200. Shepherd once narrowly able to beat the #8 Dodge of Don Thomson Jr to the line for the runner-up position. 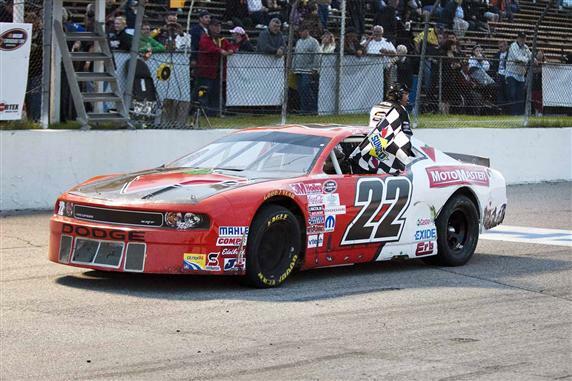 With Brad Graham collecting 4th, DJ Kennington coming home 5th and the #3 of Jason Hathaway 6th in the event, the new-for-2011 Dodge Challenger body in the NASCAR Canadian Tire Series debut concluded with a sweep of the top-six positions at Mosport.